Today is officially the first day of Spring. Hallelujah! Couple of things going on in my head these days…first of all, I wish the weather would make up its mind as to what it’s going to do…so does my yard! Secondly, I’ve been regularly staring at my own mortality…way too often. It’s always been no big deal when asked what year I was born. It’s altogether different when I subtract that year from 2018 and realize I will be 60 this summer. Back in the day, I was a member of an amazing Sunday School class at Woodmont Baptist Church. We had over 150 singles in that class and the teacher was a man and dear friend named Randy Smith, who left an imprint on every person in that class. I quote him regularly…because what he said had such great meaning. I remember him talking about the loss of a parent and “losing that first layer of immortality”. I didn’t know what that meant until Dad died a couple of years ago and it hit home hard once the reality of my life kicked in. So I find myself pondering what the next 32 years of my life will look like…from all facets. Obviously my health is paramount, as is my ability to continue to work and help others as Dad did. But I’m also looking at where my monthly paycheck is coming from down the road too! Perhaps you’ve thought about that…if you have, keep reading!If you’ve noticed the financial industry advertising on all media sources, in the last couple of years, they’ve shifted their focus from accumulation to distribution. Yes, the “baby boomers” are retiring at over 1000 people per day, but one of greatest risks they (or I should say we) face is not MARKET RISK, BUT LONGEVITY RISK. Yes, market risk is definitely on the table, but the fear of outliving your assets is what is scaring me the most…both as an advisor, and as an individual. What happens when we get into our 80s? What do we do if we run out of $$$? How do the words “fixed income” feel to you? How does that thought make you feel? Personally, it scares the hell out of me! So I’m on a mission to do something about it. Still with me? To bring home my point a little better, hopefully you recognize the epic picture above. 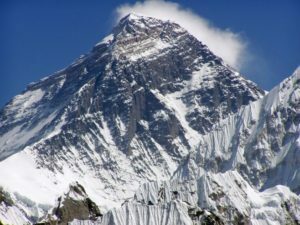 It’s Mount Everest…the highest peak in the world. So…here’s the question: When do people die on Mount Everest…on the way up…or on the way down? It’s on the way down, of course! You’ve reached the top. However, you’re tired…running out provisions…like food & oxygen…and more likely to make mistakes. The same goes for retirement planning. You’ve made it! Congratulations! Now what do you do? As you hopefully know, in addition to my roles & responsibilities as a Financial Advisor with Peachtree Planning, I am an Insurance Advisor with Elite Insurance Solutions, and focus pretty heavily in building relationships with real estate agents and their clients to help meet their personal insurance needs. In roundtable conversations with many of these realtors, we’ve discussed the best strategies for retirement. Obviously they have a bias towards real estate. I won’t come out and say that I have a bias towards strictly using traditional investment strategies, but I will say that some of their strategies utilizing properly structured investment real estate have merit towards creating lifetime income streams. The operative words being “properly structured”. 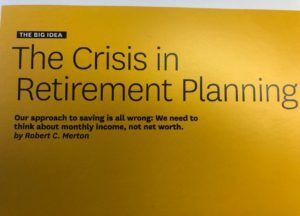 What is my retirement planning strategy? Is my goal just to accumulate a BIG PILE OF MONEY at age 65 or 70? I’m running out of real estate in this blog…no pun intended! As always, I close with two things. The call to action is here if you are searching for answers to these questions and the latte is waiting. Of course, thank you for your continued readership…regardless of the source, either in your mailbox or on Facebook. I’m blessed by what you allow me to do for a living. I think Dad would be proud. Everything is happening at once, so Happy Spring, Happy Easter, Happy Passover and let’s not leave out Happy April Fool’s Day!